The change comes after unhappy perp and pref holders, represented by the Securities Investors Association (Singapore) or Sias, complained that they are not agreeable to the "paltry" recovery rate of 10.7 per cent on their original investment that Hyflux needs them to accept in order to return to solvency. In comparison, Hyflux's senior unsecured creditors, namely medium-term noteholders, unsecured banks and contingent claimants, are promised a minimum recovery rate of 24.5 per cent under the same scheme. This second group gets to ride more upside because if none of the contingent claims are crystallised, 80 per cent of their proportionate compensation (which will be held in escrow) would have been distributed to noteholders and banks. The remaining 20 per cent would have been distributed to the managers of the projects for which the contingent claims were extinguished as "management payouts", according to Hyflux's Feb 15 court affidavit. Sias president David Gerald argued last Friday: "While we understand that perp and pref holders stand to receive nothing in a liquidation scenario, they require a more equitable distribution ... At a very minimum, any returns over and above the projected liquidation recovery of 8.7 per cent to the unsecured claims should be proportionately distributed among the unsecured claims and the perp and pref holders." Hyflux said on Friday that it had communicated the Sias proposal to its senior unsecured lenders. "Having carefully considered both your letter and their response, we propose making amendments to the Hyflux scheme which will provide for the (perp and pref holders) to share ... the upside from contingent liabilities extinguishing or expiring," Hyflux said. With the changes in place, senior unsecured creditors will still receive a minimum 24.5 per cent recovery on their principal. The difference now is that the management payout will be reduced from 20 per cent to 10 per cent of the cash allocated to any contingent claims that are extinguished. Hyflux confirmed that no member of the present board or senior management will receive any part of the contingent claim management payouts. "All of these amounts will only be distributed to the project staff responsible for the extinguishment of the contingent claims," Hyflux said. This is to incentivise project managers to complete projects on time, so that more claims will not be called. Perp and pref holders will also receive a pro rata share of the remaining 90 per cent of the cash (but not equity) allocated to any contingent claims that are extinguished. Hyflux said: "This means that when contingent claims under the scheme extinguish over the next two years, 90 per cent (up from 80 per cent) of the cash allocated to those extinguished contingent claims will be distributed among both the (perp and pref holders and senior unsecured creditors), rather than just being distributed among the (senior unsecured creditors)." Hyflux has accounted for S$678 million worth of contingent claims in its proposed scheme. Under the scheme, S$93 million in cash and 10.87 per cent of the assumed S$667 million equity value of the recapitalised Hyflux (which works out to an implied equity value of S$72.5 million) will be set aside for contingent claims. Meanwhile, 73 parties have filed proofs of claims against Hyflux amounting to S$3.51 billion, Hyflux said in a separate filing on Friday. This value is higher than the S$2.66 billion claims counted under the Hyflux scheme in an "explanatory statement" that Hyflux published on Feb 22. The wide variance is to be expected as some parties may overstate their claims. "When people put in their claims, they don't do their own mitigation. We just aggregated everything and haven't done the adjudication yet," a source close to Hyflux said. More accurate claims figures will be released after adjudication on March 16. Hyflux had asked creditors and stakeholders to file proofs of claims ahead of scheme meetings to vote on its debt restructuring plan. The proofs will form a basis to vote on scheme proposals and to receive payments. 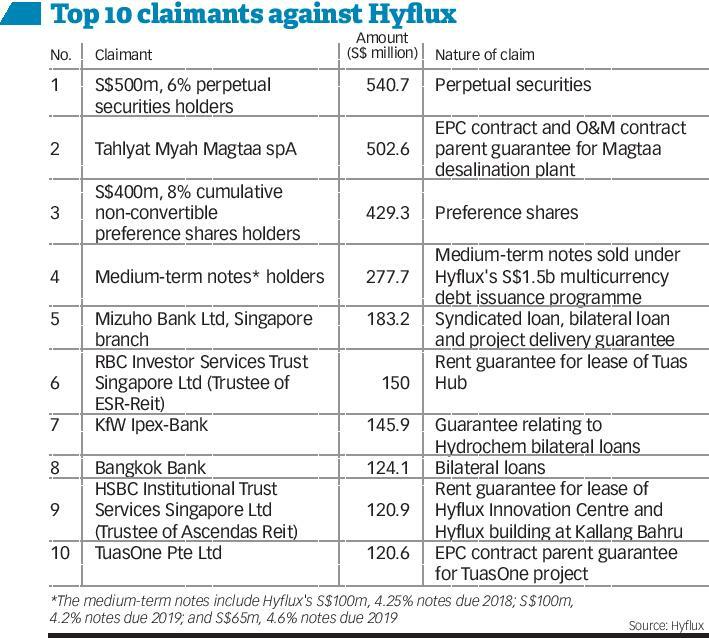 In particular, retail investors in Hyflux's perpetual securities and preference shares have filed proofs for some of the largest claim amounts. Owners of its S$500 million, 6 per cent perpetual securities have filed claims worth S$540.7 million, while owners of its S$400 million, 8 per cent preference shares have filed claims worth some S$429.3 million. Hyflux's medium-term noteholders are also claiming a combined total of S$277.7 million. Project company Tahlyat Myah Magtaa SpA has filed a proof of claim worth S$502.6 million for an EPC (engineering, procurement and construction) contract, and an O&M (operations and maintenance) contract parent guarantee related to Hyflux's Magtaa desalination plant in Algeria. The Singapore branch of Mizuho Bank is also claiming S$183.2 million for a syndicated loan, bilateral loan and project delivery guarantee, while KfW Ipex-Bank is claiming S$145.9 million for a guarantee relating to Hydrochem bilateral loans, the filing showed. Other claimants include the trustee of ESR-Reit, RBC Investor Services Trust Singapore Ltd - which is claiming S$150 million for rent guarantee related to Hyflux's Tuas Hub lease - and the trustee of Ascendas Reit - HSBC Institutional Trust Services (Singapore) - which is claiming S$120.9 million for rent guarantee related to the lease of the Hyflux Innovation Centre and the Hyflux building at Kallang Bahru. DBS Bank is also seeking S$109.2 million for a syndicated loan, and various EPC contract performance bonds, the filing showed. In a separate filing to the Singapore bourse on Friday, Hyflux disclosed that MAA Kuthari Global LLC had filed a notice of arbitration on March 1 against its indirect wholly-owned subsidiary, Hyflux EPC LLC. The legal action relates to disputes between the parties over a subcontract dated March 28, 2016, for the installation of systems for a proposed desalination facility to be developed in Qurayyat, Saudi Arabia. On March 7, the Singapore International Arbitration Centre informed both parties that the arbitration was "deemed to have commenced" on March 5, the filing showed. Hyflux said it is currently seeking legal advice on MAA Kuthari Global's claims, and will take all necessary steps to protect its rights. "Due to the uncertainty of the outcome of Hyflux's ongoing reorganisation process and the unpredictability of the financial outlook for 2019, Hyflux is therefore currently unable to assess and disclose the financial impact of the arbitration proceedings on the Hyflux group for the current financial year ending Dec 31 2019," Hyflux said. At Hyflux's make-or-break scheme meeting for creditors on April 5, the company will be asking perp and pref holders - a group of 34,000 mom-and-pop investors, among them retirees - to vote for the deal that offers them a 10.7 per cent recovery on their principal. Medium-term noteholders have been offered a recovery rate of at least 24.5 per cent. Before the scheme meeting, Hyflux is set to meet these retail investors in a third round of townhall meetings on March 13. Earlier this week, Hyflux subsidiary Tuaspring Pte Ltd was slapped with a default notice from the Public Utilities Board (PUB), for failing to keep its desalination plant "reliably operational" as required under the Water Purchase Agreement. The national water agency also warned that it will take control of the plant if the company's defaults are not resolved. PUB's notice to Tuaspring comes amid a petition by over 2,000 affected Hyflux retail investors seeking a government bailout.